Always call from a safe location. If the house is on fire, get out first and then call from a nearby telephone. Teach children to remain as calm as possible when speaking with the 9-1-1 operator so they can get the proper and correct information to send help. Wait until the 9-1-1 operator tells you it is okay to hang up the telephone. It is common for 9-1-1 operators to keep young callers on the line until help arrives. 9-1-1 operators are also trained to provide life saving directions to callers during medical emergencies. If you call 9-1-1 by mistake, don’t hang up. Tell the 9-1-1 operator there is no emergency and you dialed by accident. If you hang up before speaking with the operator, they could send emergency crews to your location needlessly. Do not call 9-1-1 as a joke or prank. You can get into serious trouble. More importantly, you can delay someone else getting the help they need in an emergency. Do not hang up the telephone until the 9-1-1 operator tells you it is okay to do so. Do not call 9-1-1 for animal emergencies, (Example, Cat stuck in a tree). Call your local ASPCA office or call the Allegheny County Communications Center’s Non-emergency number at 412- 473-3056 for assistance. Do not call 9-1-1 if you are on a cell phone and are unwilling or unable to give a accurate location of the incident. Please Save 9-1-1 For Real Emergencies! The portable fire extinguishers are properly labeled, located, and in working order. The portable fire extinguishers are the correct type for the item(s) on fire. The fire is discovered while still small enough for use by a portable fire extinguisher to be effective, if the fire is too large for the portable fire extinguisher, evacuate all persons in the area, close the door behind you if at all possible and call 911. That the fire is discovered by a person(s) who are ready, willing, and able to use the portable fire extinguisher. Also, you should know that portable fire extinguishers are meant for immediate use on small fires. They contain a limited amount of extinguishing material and need to be used properly so that this material is not wasted. In some cases may require that an employer provide education to its employees on how to use a portable fire extinguisher that is located in the workplace. Generally, operational instructions are provided on the side of the fire extinguisher. The following is an example on how to use the “P.A.S.S.” method on extinguishing a fire with a portable fire extinguisher. Class A: A fire extinguisher labeled with letter “A” is for use on Class A fires. Class A fires are fires that involve ordinary combustible materials such as cloth, wood, paper, rubber, and many plastics. Class B: A fire extinguisher labeled with letter “B” is for use on Class B fires. Class B fires are fires that involve flammable and combustible liquids such as gasoline, alcohol, diesel oil, oil-based paints, lacquers, etc., and flammable gases. Class C: A fire extinguisher labeled with letter “C” is for use on Class C fires. Class C fires are fires that involve energized electrical equipment. Class D: A fire extinguisher labeled with letter “D” is for use on Class D fires. Class D fires are fires that involve combustible metals such as magnesium, titanium and sodium. Class K: A fire extinguisher labeled with letter “K” is for use on Class K fires. Class K fires are fires that involve vegetable oils, animal oils, or fats in cooking appliances. This is for commercial kitchens, including those found in restaurants, cafeterias, and caterers. Keep space heaters at least three feet away from things that can burn, such as curtains or stacks of newspaper. Always turn off heaters when leaving the room or going to bed. Keep things that can burn away from your fireplace, and keep a glass or metal screen in front of your fireplace. Q: How effective are smoke detectors? A: Residential fire deaths have decreased steadily as the number of homes with smoke detectors increased. Reports from the National Fire Protection Association on residential fire deaths show that people have nearly a 50 percent better chance of surviving a fire if their home has the recommended number of smoke detectors. Q: Should I replace my smoke detector? A: Smoke detectors that are 10 years old are near the end of their service life and should be replaced. A smoke detector constantly monitors the air 24 hours a day. At the end of 10 years, it has gone through over 3.5 million monitoring cycles. After this much use, components may become less reliable. This means that as the detector gets older, the potential of failing to detect a fire increases. Replacing them after 10 years reduces this possibility. Q: My detectors are wired into my electrical system. Do I need to replace them as often as battery-operated detectors? A: Yes. Both types of detectors are equally affected by age. Q: How many detectors should I have? A: The average sized home or apartment needs more than one smoke detector. The exact number depends on the number of levels in the home and the number of bedrooms. National fire safety standards recommend a minimum of one detector on each level of the home, one detector outside the bedroom area, and one in each bedroom. The detector that is placed outside of the bedroom area should be installed near enough to be heard at night through a closed bedroom door. Q: Is there more than one type of smoke detector, and what is the difference? A: There are two type of smoke detectors for homes. One type is called an ionization detector because it monitors “ions,” or electrically charged particles. Smoke particles entering the sensing chamber change the electrical balance of the air. The detector’s horn will sound when the change in electrical balance reaches a preset level. The other type of detector is called photoelectric because its sensing chamber uses a beam of light and a light sensor. Smoke particles entering the chamber change the amount of light that reaches the light sensor. The detector sounds when the smoke density reaches a preset level. Q: Is one type better than the other? A: The ionization detector responds faster to small smoke particles, while the photoelectric responds faster to large smoke particles. As a rule of thumb, fast-flaming fires produce more small smoke particles and smoldering fires produce more large particles. Thus, the response time of the two type of detectors will vary, depending on the mix of small and large smoke particles in the fire. But test results show that the differences in response time are small enough that both types provide enough time to escape. There are Dual-Sensor detectors available. Q: What is more important, the type of detector or the number? A: The number of detectors is more important than the type. Installing several smoke detectors of each type will provide better coverage in the extreme cases of long-term smoldering or fast flaming fires. But since both types respond in time to escape, the most important thing is to install enough detectors in the proper locations. Detectors are available with both types of sensors in the same unit, but they are more expensive than models with a single sensor. If the choice is between having only one of each type or having more of the same type, more detectors is the better choice. Q: My detector goes off when I cook. How can I stop this? A: Smoke detectors are designed to be very sensitive so they will alert occupants to a fire in time for them to escape. If a detector regularly responds to smoke from cooking, there are several options for handling this problem. One way is to replace the detector with one that has a button that silences it for a few minutes. Another way is to move the detector farther away, giving the smoke a chance to dissipate. Moving a ceiling-mounted detector to a wall can also reduce nuisance alarms. However, this will also make it a little slower to respond to a real fire. If the detector is the ionization type, another option is to replace it with a photoelectric. This detector is less sensitive to smaller smoke particles and thus is less affected by cooking smoke. Q: How can I test my detector? A: Every smoke detector comes with a test button. We recommend that people test their detectors regularly, at least once a month. Q: Should I use real smoke to test my detectors? A: This is not recommended because the burning objects used to create the smoke might cause a fire. Some stores sell pressurized cans of simulated smoke for this purpose. When using this product, follow the operating instructions and do not get the can too close to the detector. This prevents the smoke from coating the detector’s sensing chamber, which can make the detector inoperable. Q: How important is it to clean my detector? A: Cleaning is easy. Just vacuum the detector at least once a year. This will keep the openings to the sensing chamber free of dust, residue from cooking vapors and insects. Q: What about changing batteries? A: Smoke detector batteries should last at least one year under normal conditions. 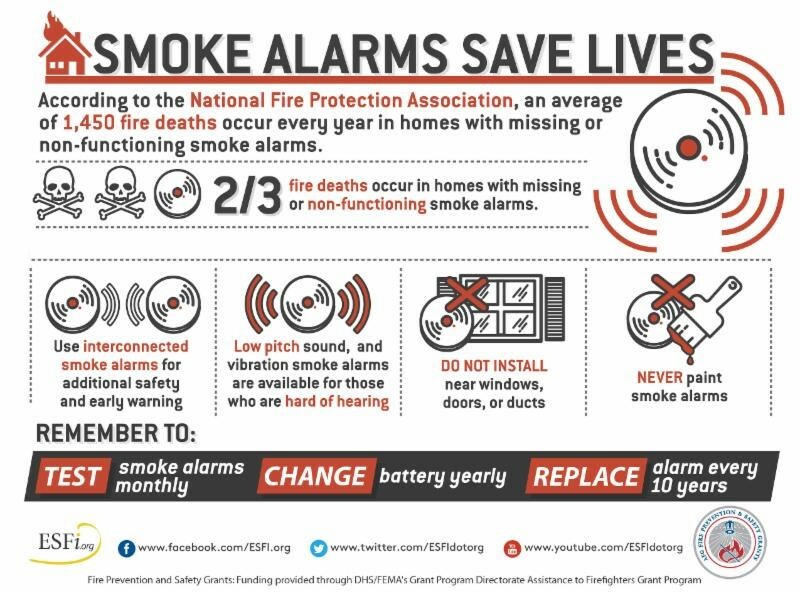 The biggest reason that smoke detectors don’t work is because people remove the batteries, e.g., to stop the low battery signal or a nuisance alarm, and forget to replace them. When a battery reaches the end of its service life, the detector will give a short beep every minute or so. It is easy to remove the battery and then forget to replace it. The best way to prevent this is to replace batteries at the same time each year before the low battery signal begins.